Veronica Darling: Shopping for bits and pieces and enjoying the afternoon! Shopping for bits and pieces and enjoying the afternoon! So around my neighbourhood I'd seen posters up about a 30% Off Sale... at the Fabric Store, and as I've never been before, I thought I'd check it out! 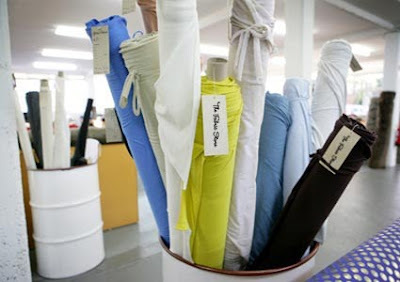 Photo from Fabric Store's website! The lovely peeps who work there are just darling, and so helpful with tips etc. I bought some knits that were on special, and got a remnant for cheap as well, and they were so cute! They admired my outfit, which was made from a bedsheet, so I was pretty embarrassed, but they loved it! I'll totally go back! I might have a think and go back to buy specific fabric rather than get some random cheap things! And then as I'd gone through my stash of white buttons and realised I'd only had odd numbers (for Emy's smockdress) and not enough for her dress, I tottered down the road to the Button Store, where my friend works! Photo from the Button Store website! And yay! I got a couple of weird buckles and the white buttons no worries! It was good to see my darling friend as she's been checking out my blog! Yay! Hi honey! I've actually never bought anything from the Button Store before, because my stash has always been pretty spot on, but do drop in if you're in the neighbourhood! Throughout my limited shopping trips I forget to shop local!